Here's a H!P Kenshuusei interview from June 2014, in a school and club setting. A year on, almost all of them have been allocated into groups, though we sadly lost one along the way. For now, let's take a look at these rising rookies from a year ago. So far, the H!P Kenshuusei have appeared in all sorts of combinations, solo, duo, or in trios. This time, we have 5 of you in your largest photo shoot. Tanabe: I had fun making lots of new discoveries, like how athletic Maria-chan unexpectedly was~, or how cool Sasaki was, despite being younger. Hamaura: It looked like I was no good at sports, but my reflexes are actually pretty good. Hey, Rikako-chan. You're talking about a senpai (sweats)!!! Makino (looking at Hamaura): If Rikako-chan had passed us the ball a bit, we would have scored some decisive shots. It's completely turned into a 2-on-1. Rikako-chan's in a pinch!! Asking for it again (laughs)!! 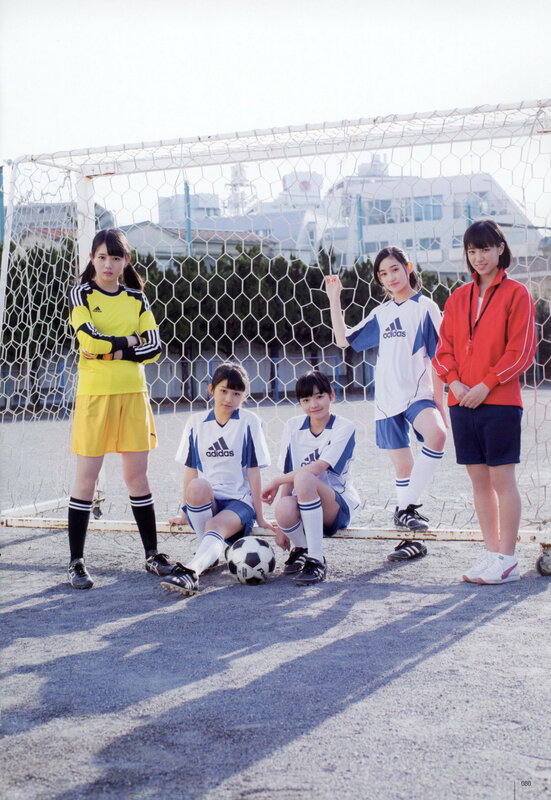 Well well, the 3 of you who were moving around, chill down...... Nanamin (Tanabe Nanami) was captain as well as keeper. And somehow Renako (Ogawa Rena) was playing the manager role (laughs). Ogawa: I'm reflecting on this photo shoot. Ogawa: Despite being manager, I couldn't bring out my voice very well. I'll do my best next time, so that I can cheer with a loud voice. Your voice isn't captured at all through photos, so don't be so down in the dumps (laughs). Hamaura: For Rena-chan, only her opinions were manager-ish. Only her opinions? She does seem like she'd be gentle, and good at taking care of people! Sasaki: Not at all!! She's not calm, normally she's super noisy. Tanabe: Said by the noisiest Sasaki!! Makino: I think that Rena-chan was mostly acting innocent today (laughs). It's like the manager's being attacked from an unexpected angle (laguhs). Tanabe: That said, we can say things like that since we're friends. While we're fellow rivals aiming for a debut, we're all precious companions! Hamaura: Eh. For me, being solo would definitely be best! Didn't you just say that 'It's great to be companions'~ (astonished)!! Sasaki: We'd be happy to do a photo shoot with companions, but I'd definitely like to stand out more than anyone else! Tanabe: In UTB!? Aren't you getting the wrong magazine? For me, I'd like to be number 1 in everything amongst the Kenshuusei. It would be great to be number 1 even when it comes to getting photos taken. And so, I'd like to heap up the solo photo shoots and establish a lead! Rena-chan, you're all right if it isn't solo? Hamaura: Maybe, if the 5 of us get to appear again, the 4 of us will join forces and do our best to show Rena-chan's true colours!! If you can, I'd like you to take care of Sasaki-chan too (laughs). Cheers for the translation as always!